The small border town of Panmunjom has been the landmark of a divided Korea for nearly seven decades. On Friday, it will be the focus of historic efforts toward peace. Ahead of the inter-Korean summit between President Moon Jae-in and North Korean dictator Kim Jong Un on Friday, an air of change is evident in one of the world's most heavily fortified zones. Preparations and repair work ahead of the meeting in the village are taking place at a "heightened speed and intensity," said J. Elise Van Pool, a spokeswoman for the U.S. Forces Korea. Located just over an hour's drive from Seoul, the Demilitarized Zone extends 1.2 miles into North Korea and 1.2 miles into the South from the 155-mile Military Demarcation Line. The buffer zone was established as part of the armistice treaty in 1953, which was signed at the Panmunjom village by the United Nations Command, North Korea and China. The agreement ceased fighting between the two sides but never truly ended the Korean War, with tension remaining high along the border. Soldiers from both sides stand face-to-face, with the MDL between them, in the 800-meter enclave called the Joint Security Area at Panmunjom. "The whole job of the joint security battalion here, the Republic of Korea soldiers and the U.S. soldiers that you see out here today is to provide security to enable dialogue between the two [sides]," Van Pool said. Three blue facilities straddling the MDL are run by the UNC to host such dialogue. Four gray huts are controlled by North Korea. The past decades have seen a number of violent cross-border clashes, most notably the Axe Murder Incident, in 1976, in which North Korean soldiers armed with axes ambushed U.S. Army troops who were cutting down a tree that blocked the view of a UNC checkpoint. Capt. Arthur Bonifas and 1st Lt. Mark Barret were killed. Since then, the two forces have been banned from crossing the MDL into each other's side, although there have been exchanges of gunfire, as well as defections. Last November, a young North Korean soldier was wounded by gunfire from his fellow troops as he dashed across the border to the South Korean side. The North reportedly replaced nearly all troops at the JSA following the incident, and tightened security around the area. However, in recent weeks, following North Korea's participation in the Pyeongchang Olympics and the warming of relations between the two Koreas, the atmosphere has changed. "It's a positive step. If you had asked me this six, eight months ago when they were launching rockets and we were launching rockets, if this would be happening, I probably wouldn't have believed it," Van Pool said. The rare face-to-face talks between North Korean leader Kim Jong Un and South Korean President Moon Jae-in will be the first summit between the two sides in 11 years. It also marks the first time a North Korean leader will cross the border to the South since the Korean War. The two previous summits in 2000 and 2007 were held in Pyongyang under the liberal Kim Dae-jung and Roh Moo-hyun administrations. 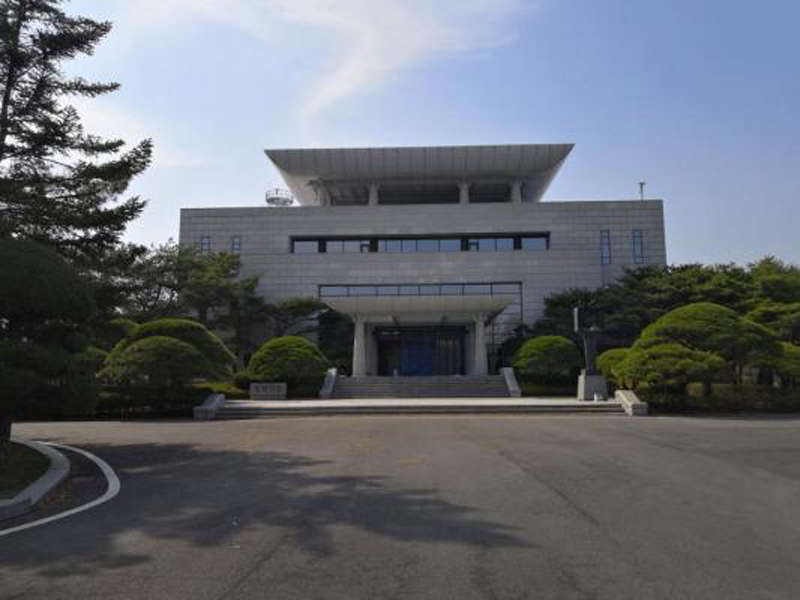 Panmunjom has served more as the middle point for talks between working-level officials. According to Seoul's unification ministry, 360 meetings have been held between the South and North since 1971, in the blue huts along the JSA and in the conference buildings on either side. The Tongilgak building lies on the northern side of border. The Peace House on South Korea's side is where Moon and Kim will meet. Moon has expressed hope that their meeting will lead to the signing of a peace treaty between the two sides, scrapping the armistice agreement that was adopted 65 years ago in the same isolated village.